Wintergreen (Gaultheria procumbens or Winisibugons, dirty-leaf, Ojibwe) is a flavor you probably know from synthetics in gum,or toothpaste. Even when natural, it is not made from this little plant but leached from green twigs of sweet birch. 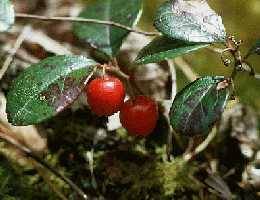 Wintergreen is a shrubby plant. Its long stem seems like a rootstock, creeping horizontally just under or on the ground. Leafy flowering and fruiting sprigs 3 - 6 " high, are really branches from the creeping stem. Leaves are oval, glossy green above, lighter below, often blotched with purple and in late fall or winter often entirely red. Fruit, as shown is bright glossy red berries. 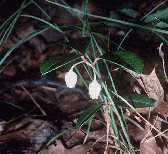 Here is a picture of the wintergreen's midsummer bellshaped white flowers. Wintergreen leaves can be gathered any time. They usually grow in woodsy shade, from nothern maritime Canada west to the Dakotas and south to Georgia. In the winter, the plant may be covered with snow. Berries persist (until birds or animals eat them) and the green leaves -- liked by deer, moose and elk -- remain when snow is scraped away from the plant. Leaves or berries, chewed on in the woods, make a minty nibble. It may be hard to find dried leaves to make wintergreen tea in city health food co-ops. Because they are so widespread, easy to gather and to recognize, many co-ops carried them for a while. But they didn';t know anything about how to prepare them, so customers were disappointed that teas made of the dried leaves perfumed th air with mint, but were tasteless. Actually, fresy leaves have to be fermented in water to develop the wintergreen in them. Pack a jar loosely with fresh leaves (if mostly red are used, tea will be bright pink) and cover it, set it in a warm place for several days until the water is bubbly. Warm the tea by setting it in a pan of hot water. This will be a strong, good-tasting minty tea. The leaves can be strained out and dried slowly in shade, for a second, boiling water-infusion tea rthat won't be so strong. Native tribes -- Mohawks, as well as Ojibwes, and others, knew the tea as medicinal as well as a healthful beverage. It contains methyl salycliates, the active painkilllers of asprin, useful for colds, headaches, and to bring down fevers. Still,. such names as "teaberry" emphasize that it was important as a year-round beverage, and as a food flavoring for meat and fish cooked with fermented leaves. CREDITS: The wintergreen photos are by faculty from the University of Wisconsin Botany Department and Madison Arboretum. \they are on the univeristy's 5000-image Botany gopher.